Cost: Reasonable. Check the MENU. 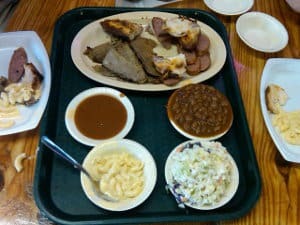 Our Review: Carl’s BBQ is a drive from downtown, but it is my favorite BBQ in Houston. Carl’s is located off of highway 290 in a spruced up trailer with lots of character. 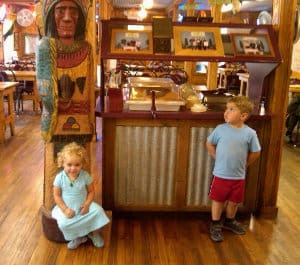 It’s nice and casual and no one cares if the kids make a little mess or are a little noisy. You order at the counter and select your meats and sides. The four of us usually share a 3 meat BBQ Plate for $11.10. The brisket, sausage and chicken are fantastic. The meat is not too fatty and not too dry. (Do note that their ribs are not my favorite ribs in town. I recommend sticking to the other menu items.) Right now, the 3 meat plate is enough food to feed my husband, my 4 year old, my 2 year old and myself… when the kids get bigger, we’ll order a little bit more. Until then, Carl’s is happy to let us share one meal and gives us extra plates to make it easy. Carl’s is a drive, but if you are headed to Austin or in the area, I definitely recommend stopping by.